KotyKatz Amari contributed greatly to our breeding program before her retirement. With the addition of her daughter, KotyKatz Scarlet Rose, we were able to keep Amari’s nice large rosetting, no rib bars, and wonderful temperament. Amari’s large rosetting comes from her dad, Tecspot Rider’s On The Storm and her beautiful color comes from mom, KotyKatz Godiva. 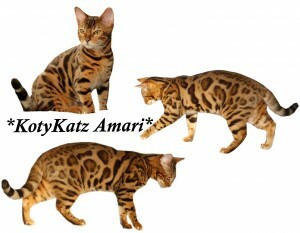 If you’d like to see Amari’s pedigree, please click here. This entry was posted in Gallery, Reference Queens and tagged Bengal, Bengal kitten, bengal kittens, brown rosetted, Brown rosetted bengal kitten, rosetted bengal cats. Bookmark the permalink.